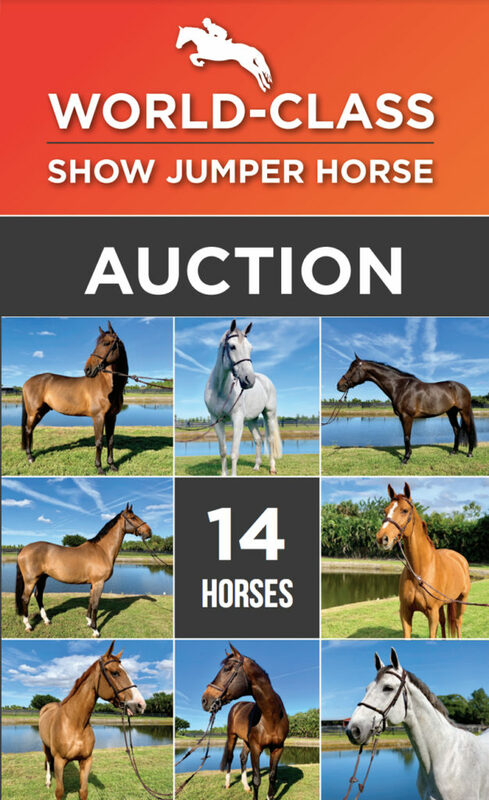 An online auction of 14 horses owned by Alejandro Andrade, father of top show jumping competitor Emanuel Andrade, is set for February 19-26 in Florida. The former treasurer of Venezuela was accused of money laundering and the horses, among other assets, were seized on November 17th in Wellington, FL, by the U.S. Treasury Department as part of a Homeland Security investigation. The animals were moved to the Delray Equestrian Center in Delray Beach, FL, managed by Brandon Mills, where they have been cared for by Palm Beach Equine Clinic veterinarians and ridden by professionals to maintain their condition prior to the auction. CWS Marketing Group will host the auction; prospective buyers can place bids from their computer or mobile devices, after registering and submitting a $50,000 deposit. The horses include Anastasia Du Park, Boy IV, Bon Jovi, Clouwni, Cortina 186, Dipssy, Hardrock Z, Jenni’s Chance, Joli Jumper, Leonardo RGS, Quilina VD Laarseheide Z, Reus De La Nutria, Ricore Courcelle and Tupac Van De Vrombautshoeve Z. Get more information at CWSMarketing.com.